As we wait for tsunami debris to reach our western shores, we are humbly reminded that disasters can very much affect us on our home shores. 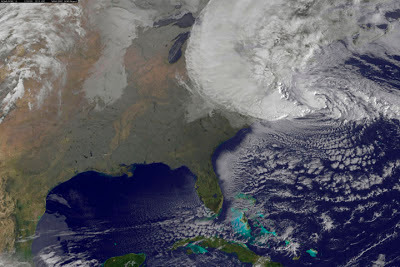 Hurricane Sandy moved into the US east coast this week, costing possibly billions of dollars in damage, destroying homes and property, and leaving millions of Americans without power. To help those who are affected by Sandy, please visit Red Cross' Hurricane Aid website to donate or find how you can help. Red Cross also has wonderful resources on disaster preparedness that could help you prepare for the case that you are affected by such an event. Hurricane Sandy covered an area of 1.8 million square miles and cut a path of destruction across North America and the Atlantic Ocean.